The spiral giblet chiller is designed for chilling hearts, livers, gizzards, necks or feet. For best chilling results a water-ice bath is used. The casing and spiral of the chiller are made of high-quality stainless, acid-resistant materials. The drive – a worm gear powered by electric motor (380V) with power rating adjusted to the chiller size, not exceeding 1.5kW, in a stainless-steel housing. Depending on the location of the processing line and chiller, parts to be chilled either fall directly from the line into the chiller (e.g. feet from the releaser or giblets from the belt conveyor near the evisceration trough) or are manually placed in the chiller. After that, the spiral moves them towards the end of the tank, where they are automatically ejected to a container, trough, conveyor belt or in any other way planned in the technological design. 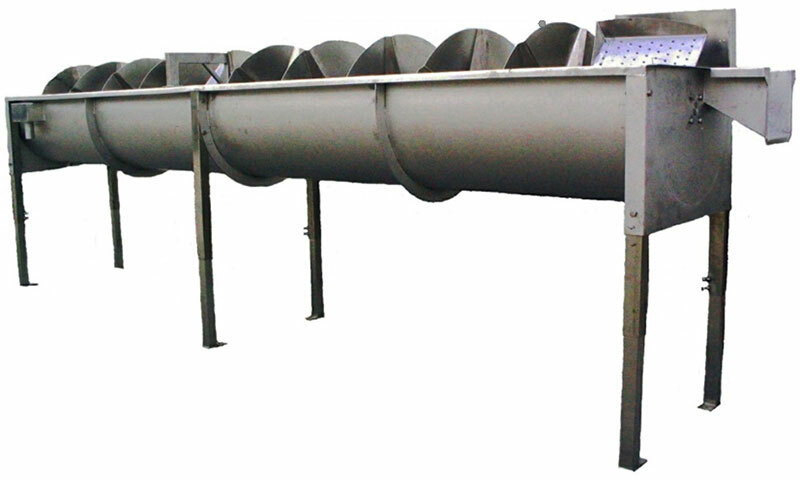 Length and width of the giblet chiller is adjusted to the capacity and size of chilled parts. Ice water is used for chilling. If municipal water is used, crushed ice or flake ice must be added during chiller operation.